Google on Wednesday rolled out a number of new features designed to make its G Suite collaboration and productivity apps more efficient and safer to use. G Suite currently has more than 4 million paying business customers, according to Google. The updates include a new design, enhanced security and artificial intelligence components, and better integration of G Suite apps — including Gmail, which is getting a brand new look. The overhaul already has been rolled out to some businesses via the G Suite Early Adopter Program. Personal Gmail users can opt in by selecting “try the new Gmail” under Settings. The changes follow the introduction last month of anti-phishing protections in response to business email compromise (BEC) threats — for example, someone impersonating an executive in order to acquire sensitive information. Those efforts — which include warning users or automatically moving suspected phishing emails to spam — already have succeeded in blocking 99.9 percent of BEC attempts, Google noted. Google will not scan Gmail in any way for the purpose of targeting ads, and no ads will be shown in Gmail for G Suite customers, Google said. Google has taken privacy protection up a notch with the introduction of Gmail confidential mode — a way to protect sensitive content. Options include adding an expiration date feature and allowing users to revoke previously sent messages. Emails also can require additional authentication via a text message before recipients can view them, which could add protection against account hacking. Confidential mode includes built-in information rights management controls that allow senders to bar recipients from forwarding, copying, downloading or even printing messages. This functionality is meant to reduce the risk of accidentally sharing confidential information with the wrong people. The confidentially mode will be rolled out in the coming weeks. G Suite’s Gmail security warnings have gotten a makeover, which should reduce instances of users ignoring them. The new warnings are bigger and bolder. Gmail also has received an artificial intelligence upgrade, including new functionality such as Nudging, Smart Reply and high-priority notifications to help with user productivity. Nudging, for example, proactively reminds users to respond to messages. Smart Reply, which was introduced last year for mobile devices, has been rolled out to the Web version of Gmail. The new high-priority notifications are designed to ensure that users are notified only of important messages, so that interruptions can be kept to a minimum. The in-box has been updated with new tools that allow users to do such things as RSVP to a meeting invitation, archive an email threat, or even snooze an email to postpone handling to a later time. Gmail has been integrated with other G Suite applications to make it easier to create and edit Calendar invitations and manage Tasks. 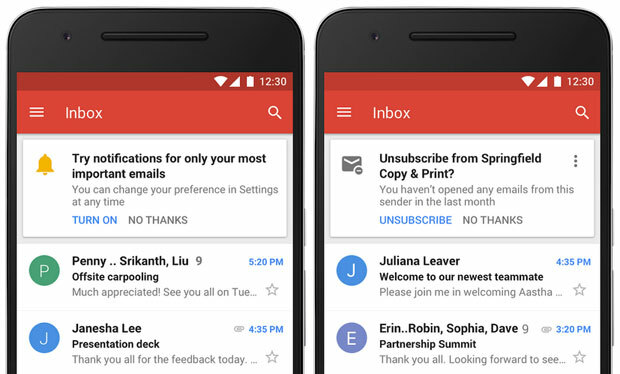 Google enhanced the Gmail Adds-ons for better integration with third-party business apps. None of the new features will change fundamentally the way Gmail generally is used, but they should make users feel more secure about sending confidential information via email. “Most people will welcome these updates and improvements, though they won’t all be equally used,” said Greg Sterling, vice president of strategy and insight at the Local Search Association. “Confidential mode will be widely adopted by enterprise users, and the enhanced security and warnings features are also needed and useful,” he told TechNewsWorld. “The biggest takeaway from the changes to G Suite is Google’s focus on providing users more finely grained security and privacy features,” noted Charles King, principal analyst at Pund-IT. More broadly, these features come at a time when many users have been scrutinizing and reconsidering large-scale IT companies’ privacy practices, King observed. “In other words, Google’s transparency and its willingness to help users better secure their emails and other work functions couldn’t come at a better time,” he suggested.